Just as Ford’s Office of General Counsel anticipated in the summer of 1982 when engineering documents were “sanitized” and collected, the Bronco II’s design flaws resulted in rollover fatalities and products liability litigation. The lawsuits began in the late 1980s. In the spring of 1990, as Ford prepared its defense in a rollover case, Rosenbusch v. Ford, Ford lawyers decided to approach Bickerstaff and ask him to testify. Ford lawyers met with Bickerstaff in a Dearborn, Michigan, hotel room to discuss his relationship with Ford. Shortly after this meeting, Bickerstaff sent a letter to Ford’s outside lawyers. In this letter, Bickerstaff agreed to allow Ford to prepare him to testify "in Ford’s favor." Bickerstaff set his fee at $4,000 a day. As determined by a federal judge in West Virginia, this letter marked the beginning of the conspiracy between Ford and Bickerstaff to lie in court, and to prevent victims of rollover cases from receiving compensation for their life-threatening, permanent injuries. When Bickerstaff testified in the Rosenbusch case in the summer of 1990, however, Bickerstaff and Ford attorneys were still in negotiations over Bickerstaff’s fee. Bickerstaff had not yet been paid by Ford and he testified truthfully in the Rosenbusch case. Specifically, Bickerstaff testified that he was concerned about the Bronco II’s propensity to roll over as indicated by the low stability index, adding that, "the stability index is a major factor or a big factor in roll over propensity." This testimony is important because the Bronco II had one of the worst stability index ratings of any of the SUVs on the market. He also testified that the engineers who worked for him were concerned about the safety of the Bronco II. As the victim’s attorneys deposed Bickerstaff and asked him to review hundreds of engineering documents that detailed safety problems with the Bronco II, Ford attorneys quickly realized that if not managed properly, Bickerstaff could be a devastating witness against Ford. Within 90 days of his July 9, 1990 deposition, Bickerstaff received his first check from Ford — a $100,000 payment for testifying in "Ford’s favor." Bickerstaff received this $100,000 payment, despite the fact that he testified as a fact witness in the Rosenbusch case, not an expert witness. Fact witnesses are witnesses who testify to the factual events and circumstances of a case: who did what, when they did it, and where. Expert witnesses possess specialized or technical knowledge that will assist the jury or the judge in understanding the case, so experts testify to the why and how of the case. Fact witnesses are rarely, if ever, compensated for their time. Expert witnesses are typically paid for their time working on the case. They are not, however, paid to make specific statements in anyone’s "favor." In addition, Ford attorneys personally represented Bickerstaff at the deposition. This is rarely, if ever, done in the case of a witness who is not a plaintiff or a defendant in the case. This questionable arrangement suggests that Ford attorneys may have promised Bickerstaff that Ford would represent him personally to protect him against any repercussions from his testimony. After Bickerstaff received his initial $100,000 payment, his testimony changed dramatically. The critical stability index was no longer a "major factor" in determining rollover propensity, but instead Bickerstaff stated, in direct contradiction to his testimony in Rosenbusch, that "the stability index . . . is strictly a comparative figure . . . an arbitrary number... [s]o I don’t attach any significance to it other than being, consistent maybe." This lie is material because the Bronco II had one of the worst stability indexes of any SUV. Bickerstaff also testified that the engineers working for him were not concerned about the Bronco II’s propensity to roll over. This lie clearly contradicted the Ford engineering documents he authored as well as his previous testimony. Bickerstaff also inflated the level of his authority by claiming that he was the engineer who "signed off" and had the responsibility for deciding when the Bronco II was safe from a handling standpoint. But, Bickerstaff didn’t have that authority; he had left the company before the Bronco II was approved. This lie had the effect of unfairly bolstering his testimony as an expert, and according to the South Carolina Court of Appeals, was enough to allow the plaintiffs in the Chewning lawsuit to sue Bickerstaff and Ford for "fraud upon the court," including the claim that Ford’s lawyers paid Bickerstaff to lie on the stand. By 1996, Bickerstaff’s rates for testimony and depositions "in Ford’s favor" had increased from $4,000 to $10,000 a day. Bickerstaff also received many more $100,000 payments from Ford, totaling $5 million over the eight years. As Ford’s "star" witness, Bickerstaff was now able to earn more in a week than he made in a year when he was a Ford employee. When asked about the nature of these payments, Bickerstaff lied again. He argued that the payments were not for testimony, but for his engineering consulting services. Yet, the 1996 letter regarding his no-bid, single source consulting "contract" defines his consulting services "for the purposes of Bronco II litigation, defense attorney briefings, my testimony given by way of deposition, plaintiff conducted depositions, trial testimony, exhibit preparation and document review." The letter does not mention engineering work. With the help of David Bickerstaff’s testimony, Ford continued to settle Bronco II rollover cases around the country, including Brenda Goff’s case. 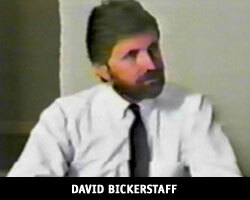 In fact, Bickerstaff testified in deposition or trial testimony in at least thirty Bronco II cases across the country. Ford lawyers met with Bickerstaff in a Dearborn, Michigan, hotel room to discuss his relationship with Ford. Bickerstaff also acted as a consultant for Ford to develop visual aids to present to juries during rollover trials. Bickerstaff, along with other Ford engineers, helped the Ford Office of General Counsel develop a videotaped test run of a Bronco II designed to convince jurors that the Bronco II did not have a tendency to roll over during avoidance maneuvers. But instead of using crash test dummies or containers of water to simulate the normal weight distribution of passengers in the vehicle, Ford engineers, including Bickerstaff, followed what is apparently Ford's standard practice for handling tests. Bickerstaff and the Ford engineers put nearly 900 pounds of lead shot on the floorboards and at the base of the seats, artificially lowering the center of gravity and countering the Bronco II's natural tendency to roll over. The vehicle appeared deceptively stable in the videotape prepared for presentations to juries. These facts were enough to convince a federal judge that — as a matter of law — Ford and Bickerstaff "engaged in a conspiracy to commit fraud" upon Brenda Goff, her family, and her dead son. The fraud specifically identified by the court in this case was Ford’s agreement to pay an expert witness to lie under oath. At least twelve other lawsuits are pending in courts across the country to determine whether settlements or past cases can be reopened because of Ford's fraud on the court. Many of the other cases, including the Chewning case in South Carolina, deal with whether state law will allow a plaintiff to seek to reopen a closed case or a settlement because of an allegation of fraud. The Goff court, however, is the only court who has evaluated the evidence and answered the question whether Ford and Bickerstaff actually conspired to commit fraud. When juries were presented with this evidence, they reacted harshly against Ford. In Commack v. Ford Motor Company, C.N. 93-33808, (Harris County, Tex. 1995), Bickerstaff was confronted on the stand with the 1990 "in Ford’s favor" letter. The jury awarded the victims $22.5 million in punitive damages. In Clay v. Ford Motor Company, C.N. 5:96CV2127 (N.D. Ohio 1998), Bickerstaff’s "consulting" arrangement with Ford and his ever-changing testimony were presented to the jury, who awarded the victims $17.5 million in compensatory damages. During the Goff fraud trial in 2001, Bickerstaff was represented by criminal defense attorney Christopher Todd. After the 2001 West Virginia ruling in the Goff case, Bickerstaff fled to his native England.